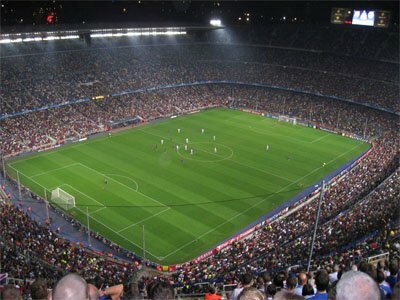 Even before they changed the football landscape by inventing the tiki-taka style of play, FC Barcelona have been known for their likable and highly watchable brand of football that always seemed to produce results. During their long and immensely successful history, they have won 23 La Liga titles, 27 Copa del Rey trophies, five Champions Leagues and four Cup Winners' Cups. As one of the richest and most popular clubs in the world, they can afford to be owned and financed exclusively by their own supporters. Since its inception, Barcelona has been a major symbol of Catalonia and its culture, as evidenced by its motto, which says "More than a club" (Més que un club). Team shot of FC Barcelona in 1903. In 1899, football pioneer Joan Gamper decided he wanted to form a football club. After eleven other enthusiasts responded to his newspaper advert, the dream became a reality and Barcelona was born. 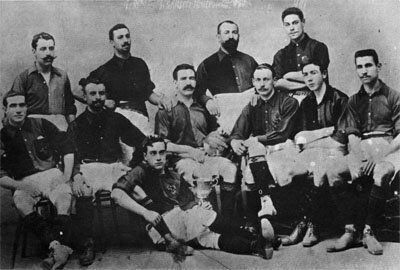 The new club started off its journey successfully enough; after losing to Bizcaya in the final of the inaugural Copa del Rey in 1902, Barcelona bounced back in style by winning the competition eight times between then and 1928 (they were also succesful in the regional Campionat de Catalunya). The following year, they clinched the inaugural La Liga before entering a period of decline due to the ongoing political conflicts in the country, which eventually grew so large that they resulted in the outbreak of the Spanish Civil War and the beginning of Franco's regime. Gamper’s time in Barcelona ended abruptly after he was deported from Spain because of political reasons. A few years later he committed suicide. Josep Sunyol had become the new director of FC Barcelona. He was a left-wing politician and this would finally lead to his death, he was executed by the Francoist regime in 1938. While life under Franco was proving arduous from a political point of view (the club was in fact forced to change its name to the less Catalanian and Anglian sounding Barcelona Club de Futbol and the Catalan colors were removed from the crest), the next two decades were reasonably successful for the club. 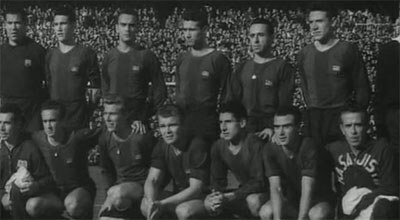 In the period from 1942 to 1957, Barcelona claimed five La Liga titles and five Copa del Rey trophies. Following their move to the newly built Camp Nou, the club's officials decided to turn a new leaf and appoint Helenio Herrera as the new manager. Under Herrera's guidance – and with a Ballon d'Or winner Luis Suárez (not the Uruguayan footballer) as the team's leader on the field – Barcelona won two consecutive La Ligas and one Copa del Rey in the next three years. Even though Barcelona made the history books by becoming the first team to defeat Real Madrid in the European Cup, the 60s as a whole were largely a disappointing time for the club's supporters. With Di Stefano in his prime, Real Madrid was simply too strong of an opponent and Barcelona had to settle with two Copa del Rey trophies for the decade. Ironically, this would prove to be a common theme in the coming years. In 1973 the Dutch star Johan Cruyff joined the club and was one of the reasons that the team managed to claim a La Liga title in 1974, the first in ten years. The waiting for the next league victory would again hang over ten years until the team with Terry Venables as manager could win another one. This era wasn't all doom and gloom for Barcelona, though, and the trophy collection would continue to increase rapidly since Barça were far more successful in the cup competitions. During this period, Barcelona won four Copa del Reys and two Cup Winners' Cups. In 1979, Cruyff came up with the idea of founding a football academy that would function on the same principles as the celebrated Ajax Youth Academy. His proposal was eventually accepted, and an old country building named La Masia was converted into the Academy headquarters. In the years that followed, La Masia became the most revered football academy in the entire world, known as much for its immaculate top-down organization as for the many players who passed through it and became stars. The list of La Masia-bred youngsters includes Josep "Pep" Guardiola, Cesc Fàbregas, Gerard Piqué and Lionel Messi. The year of 1988 is notable for Cruyff's return to Barcelona, this time in a position of manager. He immediately showcased his eye for talent by assembling a so-called "Dream Team," combining home-grown players such as Josep "Pep" Guardiola and Txiki Begiristain with international stars like Michael Laudrup, Romário and Hristo Stoichkov. Perhaps even more importantly, the football philosophy Cruyff brought with himself to the club served as a stepping stone to what would later become the tiki-taka system. 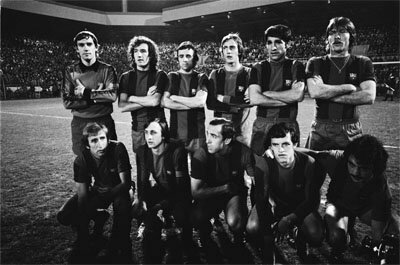 Under Cruyff, Barcelona claimed four consecutive La Liga titles, two Copa del Rey trophies, one Cup Winners' Cup, as well as their first European Cup trophy. In addition to all his accomplishments while at Barcelona, Cruyff opened the club's door for other celebrated Dutch internationals. Barcelona's "Dutch connection" was at its most prominent during the 90s and early 00s, with Ronald Koeman, Patrick Kluivert and Giovanni van Bronckhorst in particular leaving a big mark at the club. The Dutch influence did not end with their players, either; shortly after Cruyff's departure from the club in 1996, Louis van Gaal took over as manager and continued a streak of good results by leading Barcelona to two La Ligas, two Copa del Reys and one Cup Winners' Cup, all before the turn of the century. The imposing Camp Nou stadium. Losing Luís Figo – one of the club's heroes up until that point – to Real Madrid's "Los Galacticos" in 2000 proved to be a tough blow for Barça and their ambitions. The early 00s saw many changes in the club's personnel, but things didn't turn for the better until the arrival of another Dutchman in 2005 – Frank Rijkaard. Much like his compatriots Cruyff and Van Gaal before him, Rijkaard went on to form a star-studded team by combining expensive international signings such as Ronaldinho with a base of upcoming Spanish players like Carles Puyol, Xavi and Andrés Iniesta. With Rijkaard in charge, Barcelona won two La Ligas and one Champions League. In 2008, Pep Guardiola took over as the club's manager, having previously coached Barcelona's B Team. Being a product of La Masia himself, Guardiola fully understood the importance of the Academy and the possibilities it holds. His coaching methods focused primarily on the now-famous tiki-taka, a style of play combined Cruyff's penchant for quick passing and constant movement with maintaining possession at all costs. In addition to that, this tactic favored zonal marking over the traditional, formation-based system. Soon enough, tiki-taka turned into a conceptual revolution in its own right, leaving Barcelona in a great position to profit off it. During his four years at the helm, Guardiola turned Barcelona into the most dominant club in the world. Led by La Masia's newest wunderkind, Lionel Messi, Barcelona went on to decimate any opposition in their path, winning three La Ligas, two Copa del Reys and two Champions Leagues from 2008 to 2012. Even after Guardiola's departure, Barcelona would stick to the successful formula; in the years that followed, they claimed an additional two La Ligas, one Copa del Rey and the 2015 Champions League. Barcelona's blaugrana shirt was under a long time free from any sponsor logotypes (the exception was UNICEF, which wasn't a typical sponsor deal). But in 2010 a deal with the Qatar Foundation that would generate €30 million (for a contract between 2011 and 2015) was apparently too much to say no to. By many reasons this was controversially decisions. In addition to the fact that the t-shirt no longer was "clean" (the Unicef logotype had been there for some years, but it was a completely different thing), it was a deal with a company from a country with a dictator regime. Even though the members (FC Barcelona is owned by its own members) said yes, many Barça fans have been doubtful to the deal. The current crest of FC Barcelona was designed in 1910, until then a diamond shaped crest had been used. The former logo had a crown above the shield analogues to the present logo of Real Madrid. The crest from 1910 was in fact design by a former player, Carles Comamala. Although Comamala's crest has been modified several times over the years, it is still very alike the first version. The upper left white and blue flag is actually England’s and the reason is that England and Catalonia have the same patron saint. The yellow and red flag in the upper right is the Catalonian. The initials have shifted from FCB. to CFB. and back to FCB. again, standing for Club de Futbol Barcelona and Football Club Barcelona, respectively. 1899 The club is established. 1900 First season in the Campionat de Catalunya (Catalan football championship). 1902 Winning the first club title (Copa Macaya). 1902 Reaching the final in the first Copa del Rey. 1905 Winning the the Campionat de Catalunya for the first time. 1910 Winning their first Copa del Rey trophy. 1957 The club move to the Camp Nou stadium. 1929 Winning the Primera División in its first season. 1973 Johan Cruyff joins the club (will later be appointed as manager in 1988). 1979 La Masia, the club's youth academy, is founded. 1979 First European Cup Winners' Cup title. 1982 Diego Maradona is transferred from Boca Juniors. 1992 First European Cup title. 2004 Lionel Messi make his debut in the first team. 2006 First Champions League title. 2013 Become the second club to collect 100 points during a season in Primera División.